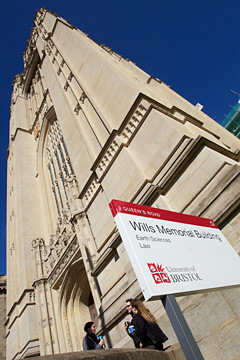 The School of Earth Sciences is situated at the historic heart of the University campus, in the neo-Gothic Wills Memorial Building. Part of the internationally acclaimed Faculty of Science, our school is one of the leading centres for research and teaching in the Earth Sciences, having been ranked in the top four UK departments of its kind since 2001. The current Head of School is Professor Rich Pancost. One of the school’s greatest research strengths is the truly collegiate atmosphere fostered by a fluid grouping of research activities with emphasis on excellence and interdisciplinarity. Our research activity is organised into five groups covering everything from climate and environmental change, to palaeobiology and geochemistry. Researchers collaborate across the groups to investigate issues such as the evolution and architecture of the Earth, global biogeochemical cycles, evolution of biodiversity and morphology, and geological hazards and risks. We attract major support and financial investment from a diverse range of sources, including RCUK and particularly NERC, the EU, the Royal Society and other charitable bodies, and industry. The school boasts some of the best research laboratories in the UK, with a further £3 million being spent by the University on upgrading facilities. Our research output is prolific, with over 120 ISI cited papers published each year in leading scientific journals. The school currently offers eleven undergraduate degrees: nine single honours degrees which cover three main disciplines, Geology, Environmental Geoscience and Geophysics, each with BSc, MSci and year-abroad study options and, currently, two joint programmes with the School of Biological Sciences. These joint honours programmes will become single honours Palaeontology and Evolution degrees in 2017/18. The aim of all undergraduate programmes is to develop an enthusiasm for the Earth Sciences as a foundation for meeting the scientific challenges of the future through a learning experience informed by our position at the forefront of international research. Our students benefit from learning a wide range of scientific and transferable skills that equip them with the confidence to succeed in their chosen professional or academic career. The undergraduate student society, Bristol University Geology and Geoscience Society (BUGGS), is run by elected officers, who each year organise student-run fieldtrips, informal staff seminars at a local pub, social events and an annual ball. The Earth Sciences Graduate School hosts approximately 120 students from across the world. We have a rich and integrated community of students undertaking PhD study. Our students are regularly recognised by national and international awards, and the majority go on to research positions at the post-doctoral level. We offer two taught Masters programmes, an MSc in Palaeobiology, and an MSc in Volcanology. We also offer a one year Masters by Research. The postgraduate students organise a number of events including an annual cross-faculty scientific poster fair, a seminar series and social events. To learn more about the school, please visit Facebook and Twitter (@UOBEarthScience).